A condition in which there is reduction of visual sharpness or of peripheral visual field, which cannot be corrected by conventional means. By definition, the individual affected by lowvision has available a corrected sight lower than 3/10 and/or an alterated visual field. In younger surbjects, visual reduction is present since the birth, whereas whenever adults are affected, this is most frequently due to pathologies such as senile macular degeneration, diabetic retinopathy,high myopy, cataract, pigmentous retinite, glaucoma, cheratocone, and traumas. It is the optometric and ophtamologic component of visual rehabilitation. It includes optometric visual analysis, prescription of spectacles, lenses, and supermagnifying optic systems. ; it comprises also education to use auxiliary devices and residual sight, and, lastly; whenever necessary, the patient is directed to other rehabilitation services. In our Center are available various magnifying devices, and we can safely confirm that even patients with visual residual rated 1/10 can return to read. Our Center deals since 20 years with patients afflicted by reduced vision; thanks to most updated knowledges, we are in condition to provide even to half-blind patients the possibility to read. After an accurate optometric examination, they have the opportunity to test immediately special lenses or most suitable magnifying devices. 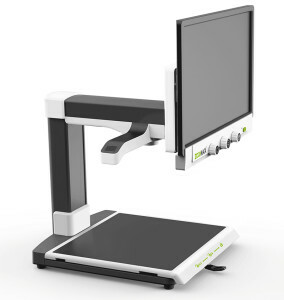 Zoomax Panda 19” desktop magnifier offers the advantages of a full desktop model, all in a space-saving and affordable design. 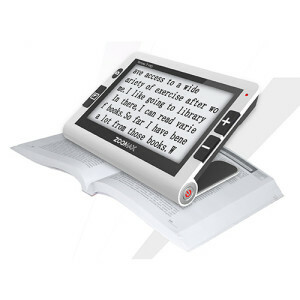 The compact Panda desktop video magnifier takes up very little space yet still provides an especially large area with high clearance under the camera for reading, writing and doing hobbies. Only 3 big and intuitive buttons are designed for 3 frequently used functions: magnification change, color modes change and brightness adjustment. 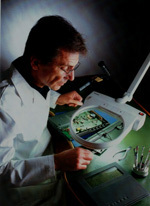 Zoomax Snow 7 HD has all the advantages of electronic magnifier. With its small book size and only 16.93 ounce, Snow 7 HD can be taken and used to read closely and see at a distance anywhere, home, school, office, bus stop, shop, etc. The auto-focus HD camera of Snow 7 HD assures the real-time crisp image absolutely while moving or changing magnification continuously from 2.2X to 19X for near and also for far! There are 12 color modes for your choice. The Mobilux Digital Touch HD is a portable videomagnifier with a large 4.3″ anti-reflective screen. From reading small print on packaging when you’re out shopping, to filling out forms or being able to read the newspaper or your favourite magazine in a relaxed and comfortable manner – the new digital reading magnifier Mobilux Digital Touch HD from E schenbach Optik with 4x – 12x magnification is a very helpful vision aid for many different situations. Whilst the comfortable 4.3″ touchscreen ensures intuitive operation at all times, the HD camera positioned centrally under the non-reflective, high contrast display, makes orientation easy during reading and provides maximum image definition. he Mobilux Digital Touch HD has a built in SD card that stores photos which are then downloadable to a computer through the included USB cable. And also, you can connect your videomagnifier to your PC or your MAC and obtain the same performance of a desktop magnifier. Binocular, widescoop galileian system, suitable for near or distant focusing. Enlargements from 2x to 5x. The Ocutech Ves autofocus system allows the patient to move normally even outdoors; the system is based on a keplerian optics principle, with automatic focus adjustment from 30 cm to infinite; enlargements from 3x to 6x. The classroom method allows to view the texts written on the blackboard and at the same time to watch the the desk. The camera that uses the Easy School system is autofocusing, thus allowing to watch a person who talks and moves with no problems of manual focusing. Enlargement is adjustable from 3x to 40x. Practical and effective are the supermagnifying lenses that allow to enlarge hugely scripts and images. Nowadays, patients afflicted by loss of visual field due to cardiovascular or traumatic events, can improve their peripheral field with the new EMIANOPTIC lenses by Dr. G.K. Sterns, MD from Rochester, N.Y. The loss of peripheral visual field is caused by pathologies such as glaucoma or pigmentous retinite. The consequent tunnel-shaped vision can be widened with the special prismatic lenses. Damages caused by excessive exposure of skin to sunlight are often mentioned not as much are the damages to sight. The studies of Dr.JJ Weiter and Dr.Marco Cordella (Ophtalmic Clinic of Parma)have given evidence to a strong correltion between iridis colour, colour of the hair and senile degenerative maculopaties. In a study made by Dr. Weiter (1985) on individuals affected by senile macular degeneration it has been observed that 76% of the subjects affected had fair iridis and 57% fair hair. These frequencies, compared to a monitored group of people, showed a statistic relevant correlation between prevailing macular degeneration and colour iris (the more is clear the less is protected). 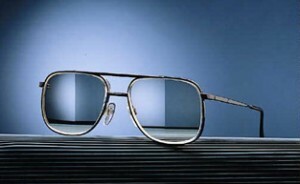 On consequency, some types of sunglasses can turn out to be dangerous if, when reducing the sunlight, do not filtrate adequately the most dangerous irradiation, that is UVA and UVB rays and high energy Blue light.Some of the most common eye deseases can be delayed by adeguated by slowing eye ageing protecting adequately from UV and Blue radiations. To postpone by 20 years such deseases would practically prevent catharat and macular degeneration, which are considered relevant causes of visual defects in the United States. It is particularly important to sort out the most effective sun glasses with PHOTOPROTECTIVE filters, in Olent Optics are available for test the photochromatic lenses C.P.F. by Corning France, melanine lenses by Blue Blocker, Photoselector etc..
Optometric visual analysis for persons affected by visual defects costs between 50 to 80 Euro depending on time necessary to analyse and solve the problem. Prof. Olent receives on appointment from Tuesday to Saturday from 9 to12,30 e from 15 to 19,30 o’clock. Please reserve your visit or simply ask any information by sending an e-mail to :info@olent.it or call to 011-541909 / 011-5611030. Warnings: The Optical Olent is a Optometric center that does not carry out Medical-Oculistic activity.